£50 Deposit (non refundable) required to secure Caravan Booking. Remainder to be paid 30 days prior to holiday start. £50 refundable security Bond required for covering breakages etc.Usually refunded on the day you leave. Entertainment Passes are Not Included in the Prices and are Available from Kiln Park Reception. 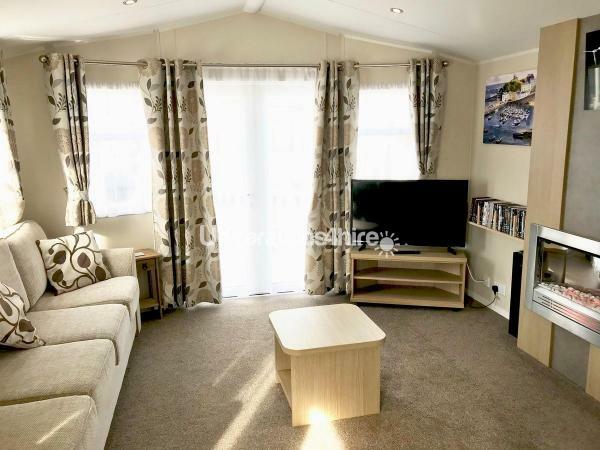 Our 2016, Willerby Brockenhurt static caravan on Kiln Park Holiday Park in Tenby, has everything you could wish for; central heating, double glazing, a family shower room/toilet, plus an en-suite toilet to the main bedroom. • Lounge - Sofa style fixed seating with fold-out bed , feature fireplace with stainless steel electric fire, freestanding TV cabinet, coffee table and wall mounted mirror, a 40" flat-screen digital TV with DVD player and MP3 player, Soundbar for Bluetooth connection plus the option of outlook French doors to further enhance the front aspect. • Dining Area - Free-standing pedestal table with fully upholstered dining chairs, feature pendant lighting and a full height storage cupboard. • Kitchen - A modern U-shaped kitchen with ample storage cupboards and shelving, laminate worktops with matching upstands, double glass fronted oven and grill, gas hob with stainless steel cooker hood, integrated fridge and freezer, stainless steel sink and drainer and laminate style vinyl flooring. • En-suite - WC and wash basin. • Shower Room - Large shower cubicle with glass sliding door and thermostatic shower, wash basin with vanity unit and mirror and a WC. 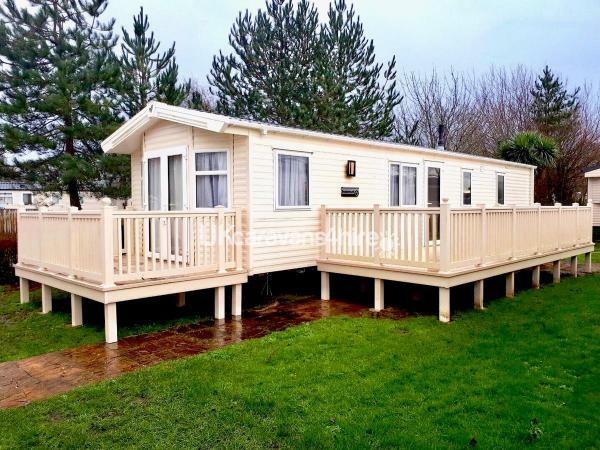 Outside the caravan is a spacious side decking area on which is furnished , along with a grassed area to play. Patio doors lead on to a seperate front decking. Additional Info: Painting Workshop, indoor + outdoor pool, Archery, bungee trampoline, segways, pool activities, nature activities, tennis, kids play areas, water walker, crazy golf, chip shop, cookie bar, papa johns pizza, lots and lots of haven activities, try reception for info or download the haven app. Absolutely beautiful caravan, even better than the pictures. 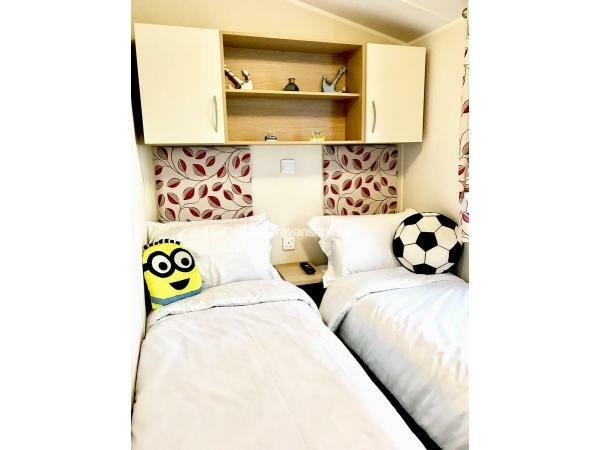 So thoughtful with toys, dvds, books etc for all the family to enjoy which was a real personal touch much different to the standard caravans for rent by Haven. Steve was lovely and helpful and we will definitely be booking with him if we stay here again. Great place to stay with a young family the communication from the owner was fantastic as I had never booked privately before. I had an invoice and receipt posted out as well as e-mailed over.The caravan was clean and had everything we needed for our 1 year old & 4 year old, the games and DVD's were handy. We had no need to take our travel cot or worry about a high chair everything was provided including the bedding. The caravan was ready early and easy to find which was brilliant and keys were in a key-safe attached to the back of the caravan.It was a short walk to the onsite shop and entertainment , with the beach and Tenby town centre also being a 10-15 minute walk away. We were so happy with our experience we are looking to book again for 2019. Excellent caravan, thoroughly enjoyed our stay at this caravan. It had everything you needed, just like checking into a hotel! It was nice to be able to have a cup of tea on arrival without going to the shop for milk and tea bags! Our children loved the games, enjoyed watching the DVD’s in bed, what lovely touches! Steve’s communication was excellent. Would definitely recommend a stay here. Thank you again for a great stay. 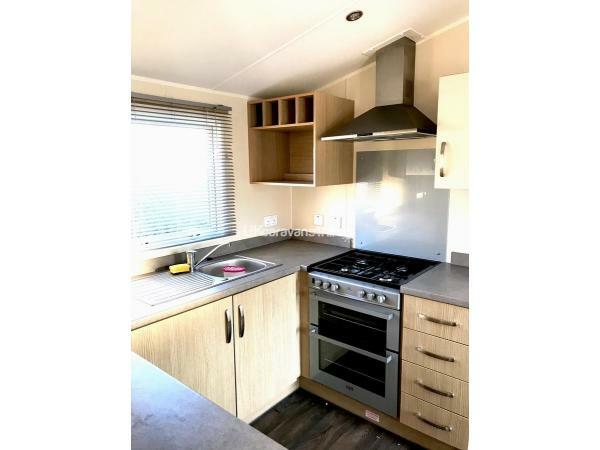 A fantastic caravan very clean and well furnished. Little touches made it easier with kids dvd's and toys. Great location on site, lovely site right on the beach with very friendly staff. Ste was a great communicator making sure we had everything we needed. Definitely recommend and hope to use again. Wow wow wow !!! If you are looking for a caravan to rent in this part of wales do not hesitate to snap this caravan up! Very clean, up to date modern interior/exterior. Main bedroom fantastic size. Tvs with dvds in both rooms which was a godsend for ours (5 year old and 13). Lovely personal touches games, books, dvds. Beds all made up, toilet rolls etc. Decking outside and furniture just adds to a relaxing holiday. Site is lovely too with plenty to do.very close to tenby etc. After travelling all over world in hotels, villas, caravans ive never found anywhere to rent as relaxing will definately be back . Thank you Sam Perfect Guests and Welcome back ANYTIME. We stayed for a week in caravan 4 adults and 10 month old grandaughter. We have stayed in many caravans over the years and this was the best .The caravan had everything you could want and it was spotless . We were kept in touch by text when caravan was ready which I thought was a nice touch .The caravan was in a quiet spot and the decking was a great touch on the sunny days . Thank you so much for making our holiday much enjoyable . 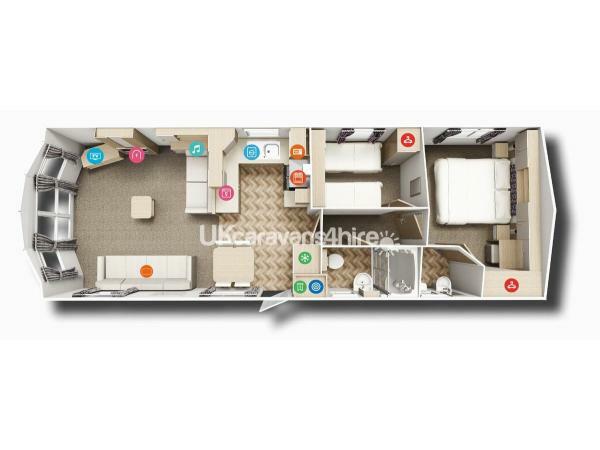 Caravan was very clean and spacious, comfortable with great heating and lots of added extras for convenience i.e. Teas coffee, washing up liquid, hand towels, shower gels. Kids enjoyed the games and dvds available. Location on park is very close to the shop and the main complex. Owners communication is excellent, very easy to book with bank transfer or PayPal. Value for money with only a low £50 refundable security bond.